‘We will litigate until every vote has been counted,’ a lawyer for the Democratic candidate said. Republican Brian Kemp declared victory in the Georgia governor’s race Thursday even as Democrat Stacey Abrams’ campaign refused to concede, insisting that outstanding votes could still trigger a runoff. Kemp, in a resignation letter to outgoing Gov. Nathan Deal, said he was stepping down from his post as secretary of state to focus on his transition to governor. His resignation came a few hours before Abrams’ team held a press conference laying out its argument for not conceding. Advisers to Abrams also announced a lawsuit arguing that voters in Dougherty County weren’t allowed the chance to vote because the county was too slow to send out absentee ballots. After the press conference, the secretary of state’s office released an unofficial county-by-county list of 21,358 provisional ballots cast throughout the state that remain to be counted. Kemp ended up the top vote-getter in the election, but the Associated Press has not declared a winner. With 100 percent of precincts reporting on election night, Kemp led Abrams 50.3 percent to 48.7 percent. That lead has narrowed as more absentee and provisional ballots have been counted. Kemp’s office and the Abrams campaign estimate there are about 25,000 ballots still to be counted, a combination of provisional and absentee votes. A runoff, if it happens, would be on Dec. 4. 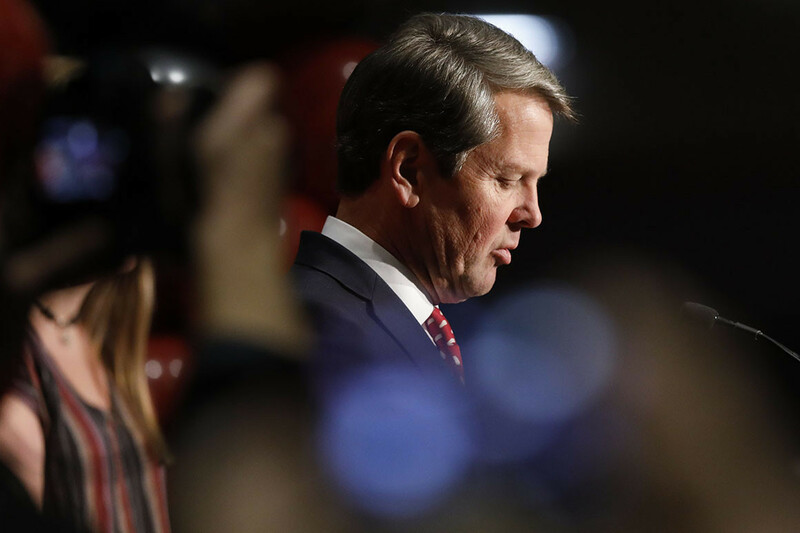 Both Abrams’ and Kemp’s teams have been bracing for the possibility of a runoff. Abrams, former President Jimmy Carter, and other critics of Kemp argue that he should have stepped down as secretary of state while he was running, to avoid effectively overseeing his own race. In a statement on Thursday, National Association for the Advancement of Colored People President Derrick Johnson said Kemp should have resigned his position earlier. Critics of Kemp have suggested that Kemp may have been using his role as secretary of state to his advantage during the election. “It’s unfortunate that Brian Kemp did not step down months ago as Secretary of State to ensure that Georgia had a fair election. Whether it’s malicious intent or benign neglect, Kemp’s actions during the election were textbook voter suppression and surely decreased voter confidence among residents in the state,” Johnson said. Kemp has denied any conflict of interest but also said that stepping down as secretary of state would give Georgians “confidence in the certification process,” according to the Atlanta Journal-Constitution. That process is expected to conclude by early next week. Democratic National Committee chairman Tom Perez said at a Christian Science Monitor breakfast Thursday that he doesn’t consider the Georgia gubernatorial election over. Members of the DNC are on the ground in the state currently helping with ballot counting efforts for the Abrams campaign. Since Tuesday’s election, Abrams’ campaign has activated its legal team and a “provisional ballot chase program” to make sure that all ballots are counted. The campaign has also advertised in African American and Latino media outlets in the state, to encourage voters to contact the Georgia Democratic Party’s voter protection hotline.